Today a very legendary, beautiful, gifted, talented, inspirational, rare Poet has gone home. 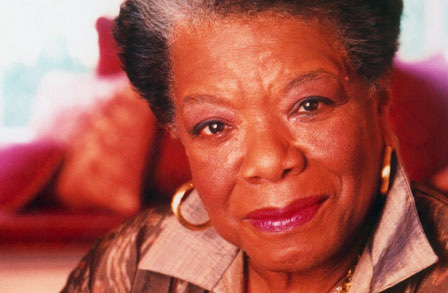 Dr. Maya Angelou died today at the age of 86. She was an inspiration to many like me who saw poetry as an exit. Like me she was an April baby, her birthday is 4 days before mine. One of her most famous works, “Still I rise” has gotten me through a lot of rough days tears inclusive. It always felt like she was writing my thoughts for me. When people say, poets aren’t really taken seriously, I always say, apparently you haven’t heard of Maya Angelou, getting taken seriously does not get better than that. With books like, “Phenomenal Woman”, “The Heart of a Woman”, and “I Shall Not be Moved”, she was that woman any strong woman would reference. She will be missed but through her work she lives. Sharing one of her most famous poems below.. Those words speak to me every time I read them. I live them, I breathe them, I am inspired by them..
What a beautiful poem, R.I.P. Maya Angelou you’ll be missed; my condolences go out to her family and friends.